My name is Soraia Santos Felgenhauer. It is with great honor and excitement that I join the Oconee County Schools. I was born in Brazil but immigrated to the United States when I started college in 1987. My first language is Portuguese but I can also speak Spanish. Upon arrive in this Country, my first hometown was Bolivar, Mo where I attended Southwest Baptist University for 4 years. My formal education was acquired from various schools. I attended Southwest Baptist University where I obtained a BS in Psychology. After finishing my degree, I moved to Denver, Colorado where I lived and worked for the next 6 years. While in Colorado, I obtained a Master Degree in School Counseling from the University of Phoenix. My love for families and students continued to grow as I closely worked with families and children at the Department of Human Services. My knowledge and experience in the education field became more refined when I moved to Georgia and started working as a School Counselor in August of 2000. I worked alongside great professionals that continued to support me as I grew and deepened my love for students. I decided to return to school and acquired an EDS in School Leadership in 2007 from Lincoln Memorial University. For the past 6 years I have been serving as a school administrator as I continue to work diligently to make a positive impact in students' lives and their academic achievement. When I am not at school, I enjoy spending time with my family. I love to travel back and forth to Brazil during time off in the summer to visit my family and share priceless moments. I am very excited and humbled by the opportunity to join such dedicated staff, hard working students, supportive parents and a caring community in Oconee County. 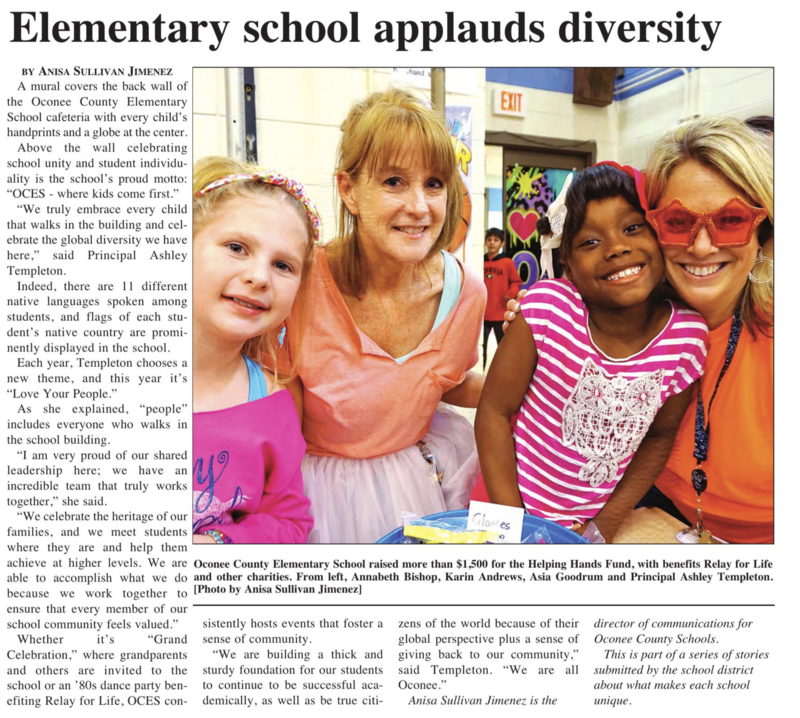 I am looking forward serving the Oconee Elementary community and along side our principal Ms. Templeton, I am sure that it will be a great year.